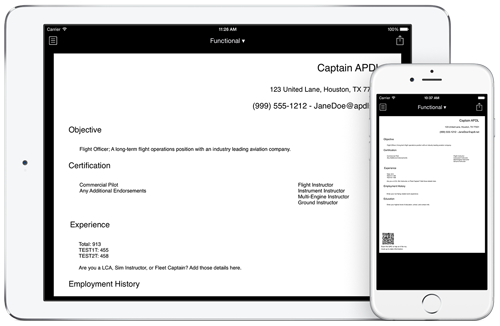 Legality is the core of APDL as the app continually monitors your legality with all required facets as set forth by the FAA. Color coded interactive legality indicators are positioned throughout the app to give you a quick reference to your legality status using green, yellow, and red indicators. Tap legality indicators to view legality issues at a glance. 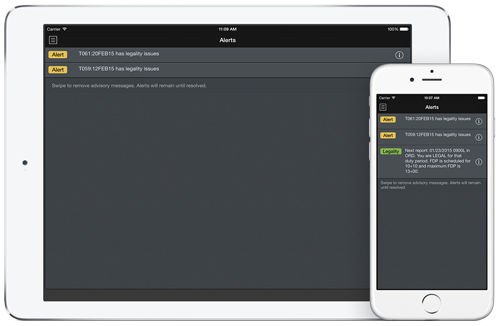 APDL integrates directly with native iOS at its core to provide you notifications on your screen even when APDL is not running. APDL doesn't just do a quick "today" check as other apps offer which may be limited and inaccurate but instead a full and comprehensive calculation of all required elements as set forth by the reg including acclimation, WOCL, required rest, lookback, and future duty. 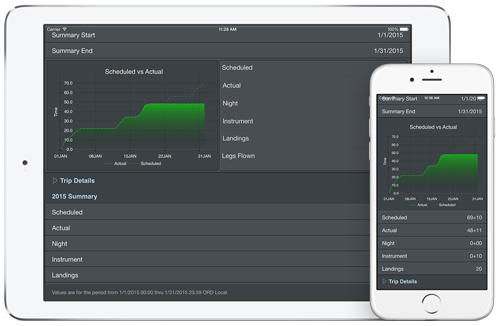 APDL is the legality tool the airline community has been waiting for and now it's available now ready to work for you. 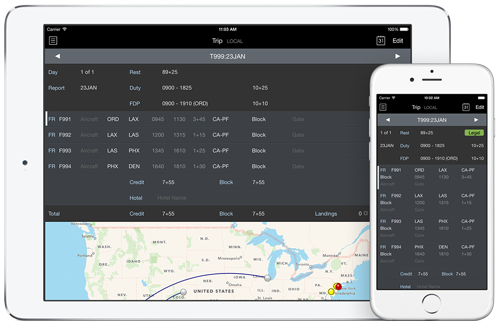 Airline pilots live off of the "trip sheet" layout and that's how we designed the interface for APDL -- quick understandable compact information of your entire trip in a single presentation. The "Trip View" offers a running dialog of your trip spanning the required duty periods and days. The trip sheet is interactive, tap a leg to quickly access the editor and make any edits as needed. Trip Views are also color coded based on scheduled vs. actual vs. completed and closed. APDL offers data protection by locking completed legs to avoid unintended edits to ensure an accurate legality computation at all times. View gate info, block, credit, hotel, and more and even tap to call your hotel directly from the trip view. Configure your own status boards by adding or removing available widgets to show information as you need it based on various phases of flight. View your legality, cumulative limits, gate information, sunrise/sunset data, current flight status, and more. Widgets are interactivie allowing you to quickly edit your leg as you fly, view legality, etc. A favorite feature among the test team this is a great central hub of the app with all of the information at a glance. APDL brings information to you in various ways both within the app as well as tight integration with iOS and Notification Center even while the app is not running. While running the app you'll see an alert bar appear color coded based on priority or the message or you can view an Alerts screen for all current alerts. The Alerts view will show you a list at all times of alerts that may require immediate action such as legality issues or simply information such as gate change notifications. APDL can advise you of your legality for an upcoming duty period a set time prior to flight per your settings configuration as well as notify you of other alerts pertinent to your duty. APDL uses NC Software's high speed secure encrypted enterprise synchronization system for fast and reliable data everywhere synchronization across all of your participating devices. As APDL is licensed "per user" you can use all of your iOS devices meeting the minimum requirement of Apple's iOS 7.1 or later. APDL does not use any third party synchronization such as Apple's iCloud which has proven troublesome for apps that depend on it for data synchronization. NC Software owns and operates its network infrastructure ensuring maximum up time and reliability taking the worry out of synchronization. With data everywhere synchronization we also include data backup as part of the APDL suite allowing a data restore capability should the need arise. 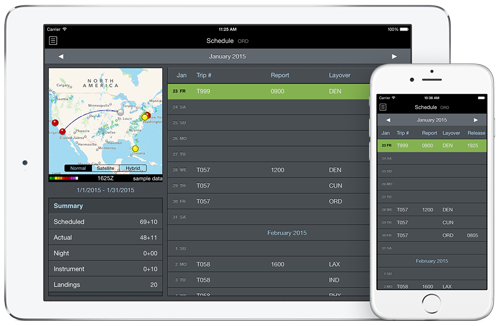 NC Software's powerful and flexible schedule importer is included with the APDL suite along with access to APDL.net - your own dedicated airline pilot portal. Import your schedule directly in the app using the in-app importer that connects to the cloud for instant processing of your trip data or use the more advanced system on APDL.net to process your trips and then import to the app as simple as a tap. Trips are preloaded and ready to be updated as you prepare to fly and then closed out with minimal effort using APDL's innovative AutoFILL auto-logging system. APDL is a complete red-book replacement tracking your duty, pay, and rest with all the facets as required by FAR 117. Use the interactive charts to analyze your information per your requirements. With the continually monitoring legality engine, duty and rest are evaluated and computed for you to ensure complete compliance without any complex math on your part. We know you will love APDL once you let it work for you so we want you to try it out for a full 90 days - FREE. Learn it, love it, see what it can do for you without spending anything. Explore all features of APDL throughout your entire bidding cycle. Use the included schedule importer and learn how APDL helps you with all aspects as described above as well as in the complete documentation available online. 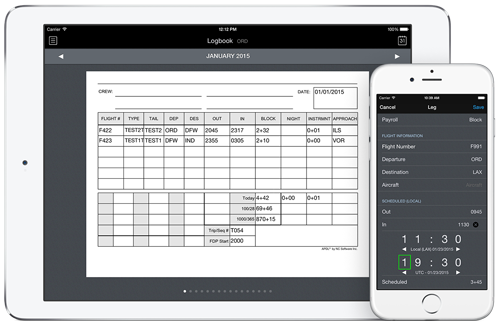 We spent three years developing APDL with an entire year in testing with over 60 of your peer airline pilots ensuring the highest quality and absolute best possible FAR 117 app bar none. With that said, we have only just begun, this is the beginning of a new era of amazing features and functionality yet to come, and much of it based on your upcoming feedback we are looking forward to. Join in with your peers on the community forums to discuss use of APDL for your contract requirements, ask questions, and even help others. 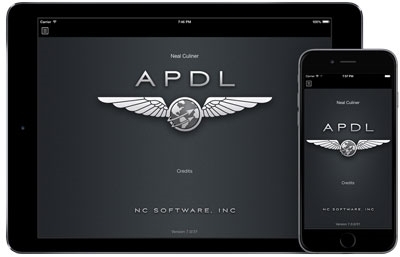 Download APDL for your iOS device today and automatically start your 90 day free trial - we know you'll love it.